Use this transaction to create production orders without a reference to a material. This transaction should be used to create re-work production orders. After settlement cost will get settled to the original production order. Note: Need to create reference operation for each plant for each UOM to avoid manual entry. Enter the description in the Group counter Description field. Enter Work Center, Control Key, Description, Base quantity. Enter and SAVE. Routing created with Reference number zzzzzzzz (50000100). 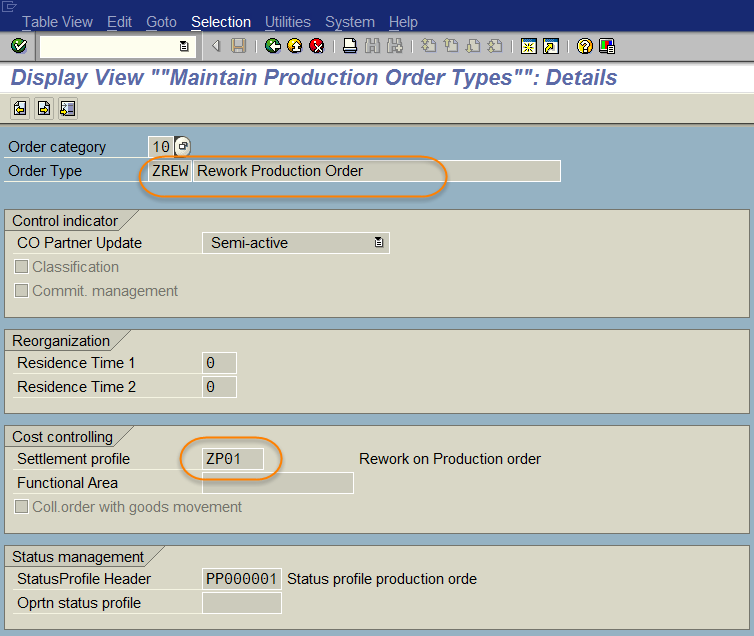 SAP Menu: Logistics > Production Order > Shop Floor Control > Order > Create > CO07 – Without Material. Enter Plant and order type. NOTE: The user can enter any relevant information into this descriptive field, such as production order number and serial number of the machine being reworked (limit of 40 characters). Enter “Rework for Production Order “123456789”. Click in the Total Qty field and enter the quantity, like 100. If the user has a specific date to start the rework order, then the finish or start dates should be entered. If no date is entered, the order will default to the current date. Select “Current date from drop down. Note: The user will be taken to the Routing Selection screen. Note: The user will be taken to the settlement rule over view screen to enter the Original order. Enter the desired information in the Cat field. 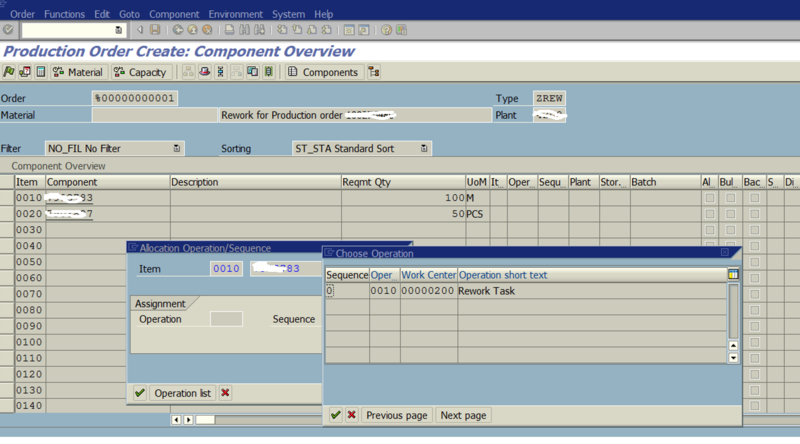 Enter the component(s) which will be used in the rework in the Component field. Click in the Reqmts Qty. field and enter qty. Click the Operation list button to see a list of valid operations. Double-click on the row to select the Default Operation. This step will tie the component to a specific operation. Release the Production order and confirm (T-code CO11N). 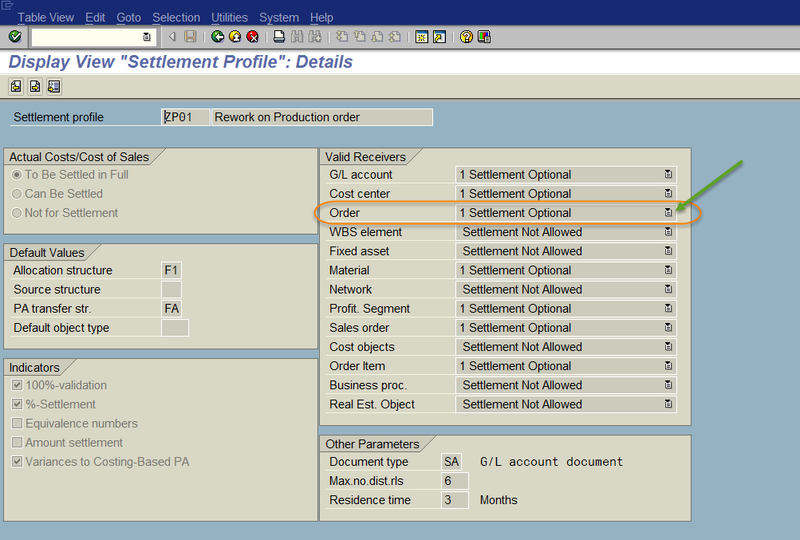 Assign Settlement profile to “ZP01”. Activate Order with option “1”. Thanks for sharing… useful info.